Hope you all enjoyed the conversation between Swamy Velukkudi Krishnan & Mr. Cho Ramaswamy in episode 02 of Sri Ramanin Padhayil, which were posted earlier. With this let us move on to the next episode of Sri Ramanin Padhayil in which, journey in the footsteps of Lord Rama began. As said earlier, Devotees/Participants from all parts of India got assembled in Bithoor or Bithur of in Kanpur District in Uttar Pradesh. Lord Rama was known to us through the great epic Ramayana written by Valmiki - The Great Sage & Author. Before offering prayers to any God, we should first offer our Pranams (respect) to the respective Gurus and Archaryas, who made us to feel the presence of GOD. Likewise, our journey should begin from Valmiki Ashram. All the devotees got down in Kanpur Central Railway Station, from there the journey started towards Bithoor, the place where Valmiki Ashram is located. On the way to Kanpur to Kannauj, you will get Kalyanpur, taking diversion here will lead to small town called Bithoor. The distance from Railway Station to Bithoor is around 27 KM's. After reaching Bithoor, all the devotees reached the banks of river Ganga. All the devotees had holy bath in river Ganga and completed their respective rituals like Pitru worship or darpan, sandhya vandan, Surya worship etc. in the banks of river Ganga and got ready with full energy and enthusiasm to travel towards Valmiki Ashram. Now let us know the significance and greatness of Bithoor. Beginning from Lord Brahma till Valmiki including Veda Vyasa are connected with this small town Bithoor. To understand the greatness of this small town, let us consider the ancient map of India. We can see the same places even today, but these places were called in different names those days based on the King ruling, people residing there etc.. Sanathana Dharma was spread all over the world. Sanathana Dharma was followed and exercised from present Iran to Cambodia. Please refer the map below, all the current places in that map had different names those days. Lets see those different names with respect to map below. ♣ Kamboja Desam/Country ↦ Many Indo-Iranians lived here. From here many would have migrated and settled down in India. ♣ Gandhara Desam/Kingdom ↦ Northern Pakistan, Eastern Afghanistan and few other parts were included in Gandhara Kingdom. The three important cities in this kingdom are Puskalavati, Purushapura and Takshasila. Rama's brother Bharata had two son's Pushkalan and Takshan. They were the founders of the city Puskalavati and Takshasila. The modern names of these cities are Peshawar and Taxila. The Gandhara Desam gave birth to Gandhari, who is Duryodhana's mother and wife of Dhritarashtra. Many places started to form in the west and east of Gandhara Desam. Sindhu River (presently called Indus) passes through all these places. ♣ Kekeya Desam/Kingdom ↦ Kekeya Desam gave birth to Kaikeyi, the queen of Ayodhya was the consort of King Dasaratha and mother of Bharata. ♣ Madra Desam/Kingdom ↦ The capital of Madra Kingdom was Sagala (today's Sialkot). Madra Desam gave birth to Madri, got married to Kuru king Pandu and gave birh to Pandava twins, Nakula and Sahadeva. ♣ Matsya Desam/Kingdom ↦ This kingdom was celebrated as Virata Nagaram. It was here that the Pandavas spent their 13th year of anonymity (Ajgnata Vasa) after their 12 years of forest-life (Vana Vasa) in the forests of Kamyaka and Dwaita. ♣ Kosala Desam/Kingdom ↦ Kosala Kingdom, ruled by the Ikshvaku kings, who were famous for their conquests and the protection of Dharma. It was in this kingdom that Lord Rama was born and where the city of Ayodhya is located. 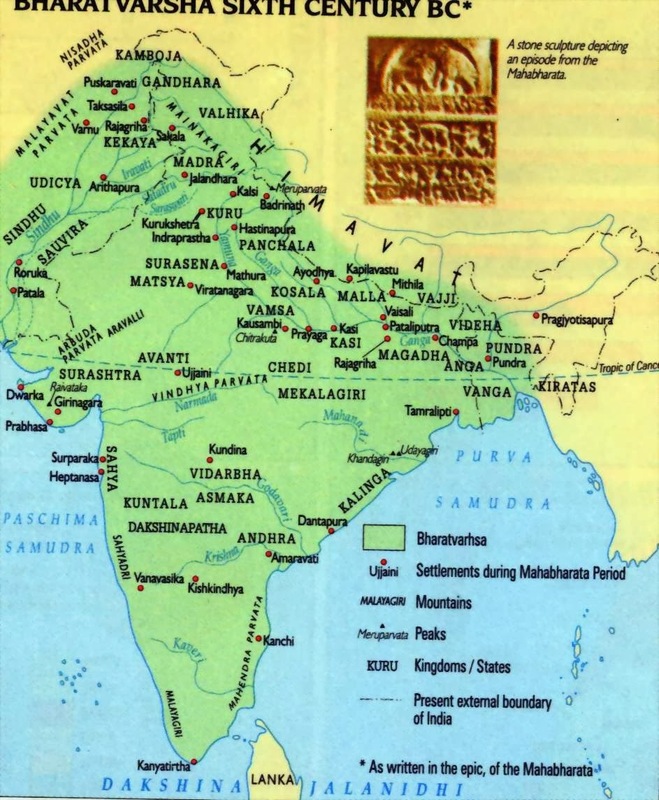 ♣ Panchala Desam/Kingdom ↦ Panchala Kingdom was divided into Southern Panchala ("Panchala proper", centered at Kampilya, ruled by King Drupada, the father in law of Pandavas and Father of Panchali and Dhristadyumna) and Northern Panchala (centered at Ahichatra, ruled by Ashwathama, the son of Drona. ♣ Kurujangala Desam/Kingdom ↦ Kurujangala Kingdom, forms the majority of what is now the modern state of Haryana. ♣ Magadha Desam/Kingdom ↦ The core of this kingdom was the area of Bihar south of the Ganges; its first capital was Rajagriha (modern Rajgir) then Pataliputra (modern Patna). ♣ Videha Desam/Country ↦ Videha was the kingdom of the royal sage Seeradhwaja Janaka, the father of Sita, Lord Rama's wife. Videha Kingdom is erroneously more popularly known as Mithila Kingdom. The ancient region of Mithila is today split into adjacent part of two countries – India and Nepal. ♣ Kalinga Desam/Country ↦ Kingdom of Kalinga, in the current day region of coastal Odisha (formerly Orissa). ♣ Vidarbha Desam/Country ↦ Vidarbha was an independent kingdom with Nagpur as Capital. ♣ Saurashtra Desam/Country ↦ Kingdom of Saurashtra is the modern day state of Gujarat. Kingdoms of the Cheras, the Pandyas, the Cholas, the Pallavas and many others lived in ancient Tamil Nadu. Hence the whole India is a holy land ancient flourished with rich historic past events, people and culture. Now we are starting our journey from Bithoor, Kanpur District in Uttar Pradesh, India. According to legends, Lord Brahma came here to start the human race. Rishi's and Munivar's lived their whole life span for people's welfare and spiritual development. Rishi's were classified into Deva Rishi, Brahma Rishi (Brahmarshi), Maha Rishi (Maharshi) and Raja Rishi (Rajarshi). Under these, Valmiki is considered as Maha Rishi. Sage Valmiki's Ashram is located in Bithoor. Divine sage Narada arrives at the hermitage of Sage Valmiki. Sage Valmiki welcomes Narada, and plies him with questions about the only one on the earth who has all 16 desirable qualities - gunah, viryam, dharma, krutagnasya, drudvrata, satyavakya, Charitra, Vidvaan, sarvabutah hitah, samartah, priya darshanah, aatmavaan, jitakrodho, dhyutimaan, anasuyukah, kasya bibyati devah ca jyata rosaya myuge. This question is the root for the birth of the epic named ramayana. This question gave birth to the great Indian epic which was written millennia before yet is popular even today. 09. Sarvabutah hitah = One who wishes the best for every butah(living thing). 16. Kasya bibyati devah ca jyata rosaya myuge = Even gods will tremble when he gets angry. This was the question asked by Rishi Valmiki. He asked," is there any person with these 16 qualities. If there is such a person, please tell me who he is. And I want to know about a person who is alive not some historical figure." 16 qualities are generally possessed by moon in hindu literature. Thats is the reason Sri Rama is also called Ramachandra. So, now Valmiki has asked the question . This is the scene of epic Ramayana's birth. Then the devarshi Narada replied as follows, "You have asked a rare question and people with such qualities do not ordinarily exist(that means the one with all such qualities is an extra-ordinary person).Yes, Valmiki, such a person exists. He belongs to Ikshavaku kula(dynasty), he is the son of King Dasharatha, people call him Rama. He has all the qualities you mentioned and along with it he is a vasi(one who has mastered his senses). He has great willpower and great physical power. He knows all sciences. He has great riches. He has strong shoulders and high cheeks. He knows use of all weapons. He can control enemies. He knows all vedas. He is equal to Sri Maha Vishnu. He protects all the beings and dharma. He can protect the entire world. He protects his own dharma. He protects people who depend on him for protection. He is extremely handsome and pleasing to those who see him. He is satyaparakram(truth is his strength)." Then Devarshi Narada tells the entire Ramayana to rishi Valmiki in a brief manner. The Ramayana told by Narada to Valmiki is called Sankshep Ramayana. It is about 100 shlokas. It is called a mala mantram. It is supposed to have great powers to those who pray through it. In the upcoming articles, we will see all the places related to epic Ramayana located in Bithoor.